Earlier this year, Mines launched a new Center for Entrepreneurship and Innovation. 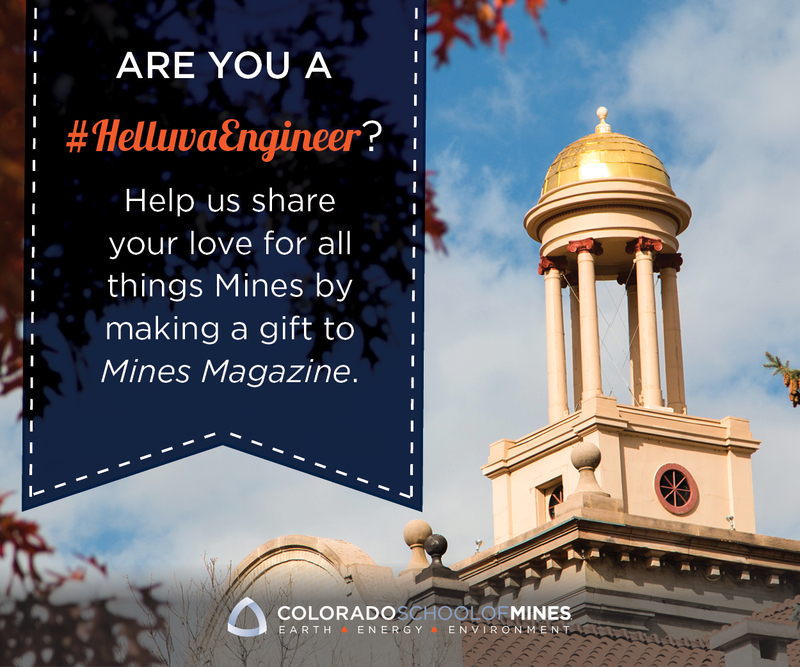 The center focuses on connecting Mines with the business community and supporting the environment of invention and enterprise that has always been at the heart of Mines. Mines Magazine sat down with the center’s director, Werner Kuhr, to ask him about his goals and the importance of entrepreneurship and innovation. What are your goals as the director of this new center on campus? The first goal is to spread this concept of entrepreneurial thinking, or teaching students how to demonstrate the value of the work they’re doing. Most people, when they think of entrepreneurship, think of starting a company, and that’s great and something I certainly want to encourage, but the same principles and process is also useful for starting a campus group, a nonprofit, a research program or even becoming a manager. They all require the same skillsets. It’s important to know how to understand how to optimize a process in order to do it quickly and in a way people will understand. The secondary goal is to actually start companies and commercial activities here at Mines. The technology is here, the people are here, the human capital is here, and having access to those resources and what I would call “entrepreneurs-in-residence”—Mines’ alumni community—has a huge potential. Why was this center created and why is it important to Mines? From a global perspective, I think every university has to be involved in these efforts. Students, expect it, new faculty expect it, graduate students expect it, the community expects it. As the level of funding has gone down, there is going to be a need for new sources of funding for research. I think it’s part of our society now. I think students are also really looking for how they are going to use their knowledge and why it’s important. I think the entrepreneurial component can bring that to them, because it’ll demonstrate to a student why they learned thermodynamics or why calculus is important. What plans do you have for this center that can you share with us? Everything is still in development, but I think there are some great synergies going on already on campus. We can offer an E&I track within certain programs to expose students to some of the core concepts and get those who are really interested to advance more quickly. In addition, there are already a number of competitions on campus, such as the Newmont Innovation Challenge, that I think could be reformatted a bit. Right now, it’s sort of a one-shot event, but I’d like to make it almost a full year process. We can provide workshops and training to help students formulate ideas and figure out how to present them, have the competition in January and then demonstrate the results of the winning teams at the end. This will help show the relevance of the innovative ideas and help build a community. How do alumni fit into these efforts? We can draw from our successful alumni community and bring them in as mentors for students. There’s potential for investors as well, if alumni want to come back and help build companies. I have been amazed at how many people wanted to help, to give back and connect with the school and current students to help them move forward and save them the trouble alumni went through in their entrepreneurial experiences. What does entrepreneurship and innovation mean to you? Innovation, to me, is the first step to doing something for the first time. It’s the idea moment. There’s nothing like it. Students do it in research labs all the time. Any time you get the first piece of the data that anyone has ever seen that’s a great feeling. But taking it to the next level and getting the same result every time, making it practical, that’s hard work. It takes a lot more, so even though that invention can take a day or a week or a month, reducing that to a practice can take years of work before it gets to the point where it’s useful. And then entrepreneurship is really taking that one step further and making the idea useable by everyone. For example, take making a widget. You know you will manufacture and distribute a million of them, find customers and determine the value and price. There are so many additional considerations that you don’t think about when you’re first inventing the idea. It’s a very different process, but in some ways, it’s very similar in that you can use the same methodology and thought processes you did in the innovation process. It’s just involves applying it to different aspects. I think the biggest difference between business today and 20 years ago is pace. You can’t sit down and write a business plan for six months and now you can go to step one and the world is changed. It’s really important to think “How do I test quickly, how do I figure out what the good fit is between product and market and how do I know that this is going to be what people really want?” You have to go talk to people. You go out and talk to potential customers and find out what they want, whether it’s the whole product or only a part of it or if there’s no interest at all. That saves you so much time and trouble, and you can spend your time effectively developing things people will actually want. What are some qualities all innovators should have? There have been so many studies about what makes a successful entrepreneur and a successful innovator. One of the key properties is “grit.” There’s also persistence and perseverance. It can be tricky, because if you’re too gritty that can mean you don’t want to change. But if you don’t have enough grit, you might not stick with an idea long enough to make sure it will work. There’s a really interesting balance between grit and flexibility and knowing when let go of something when you realize it can’t go any further. I’ve learned that failure isn’t awful, but the idea that you can actually test and change things is essentially the same as following the scientific method: creating a hypothesis and testing it. If it says yes, you keep going in the same direction; and if it says no, you change the direction. It’s not necessarily a failure, it’s an iteration. You can apply that to anything, from starting a student club to starting a business.